If you are searching for a party bus in Rochester, then your search has finally come to an end. Here at Rockstarz Limousine and Party Bus, we specialize in making sure that each and every client is not only happy with the service we provide, but that they always have an amazing party that is capable of creating a number of happy memories. When you want to rent a party bus, then there are always concerns that you will be unable to invite everybody that would appear on your guest list. Well, with us, we have sought to make the maximum use of the space that is available as well as adding in some leather chairs to give you the chance to rest as the party goes on around you. With our Rochester party bus service, you can expect to be transported into your very own nightclub on wheels. We know that the atmosphere is key, so we have worked hard to provide our clients with the perfect party place, no matter the occasion you may be celebrating. From a state of the art sound system, to a stunning laser light display, both you and your guests will be left amazed at what is inside your party bus. Ultimately, it is going to lead to you all having an even better time and experience than you ever thought to be possible. 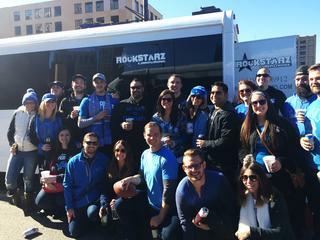 In the past, people have used our Rochester party bus rental service to celebrate a range of different occasions. From a special birthday, to an anniversary, or perhaps even a bachelor or bachelorette party, we can help you with any occasion. Perhaps you even just want to have a good time with friends, and we are even able to help with that. So, if you live in the Rochester area and are looking for a party bus for any occasion, then give us a call direct at Rockstarz Limousine and Party Bus. Alternatively, you can contact us via our website and someone will be in touch with you as soon as possible.